NASA’s Kepler spacecraft, which discovered more than 2,680 exoplanets orbiting distant stars and allowed scientists to statistically show billions more must exist across the Milky Way, has finally run out of fuel, bringing one of NASA’s most scientifically productive projects to an end after an extended nine-and-a-half year mission, mission managers said Tuesday. “The Kepler mission has been an enormous success,” said Bill Borucki, the original Kepler principal investigator and leader of the team that convinced NASA to build and launch the $692 million mission in 2009. “We have shown there are more planets than stars in our galaxy, that many of these planets are roughly the size of the Earth and some, like the Earth, are at the right distance from their star that there could be liquid water on the surface, a situation conducive to the existence of life,” Borucki said. The camera at the heart of the Kepler space telescope. Launched atop a Delta 2 rocket on March 14, 2009, Kepler was boosted into an orbit around the sun, trailing the Earth and aiming its 95-megapixel camera at a patch of sky the size of an out-stretched hand near the constellation Cygnus that contains more than 4.5 million detectable stars. Of that total, the science team picked some 300,000 that were the right age, composition and brightness to host Earth-like planets. 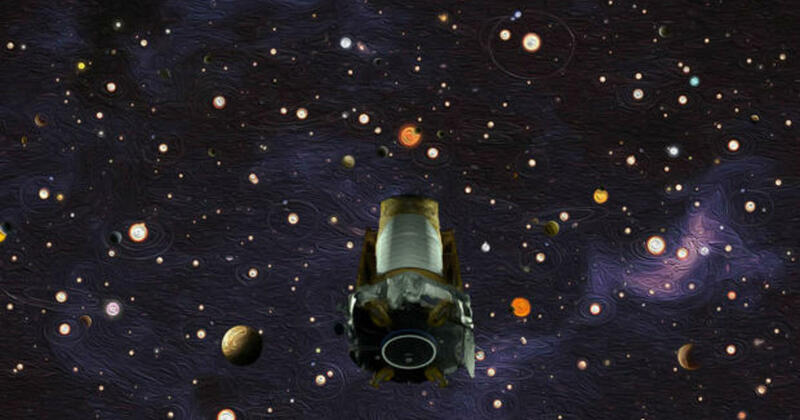 Over the life of the mission, more than 100,000 of those stars were actively monitored by Kepler. The spacecraft’s camera was not designed to take pictures like other space telescopes. Rather, it served as a sensitive photometer, continuously measuring the brightness of stars in its wide field of view, on the lookout for the tell-tale dimming that occurs when a planet passes in front of its sun as viewed from Earth. By studying slight changes in the “light curve” produced by planetary transits — comparable to watching a flea creep across a car’s headlight at a distance of 100 miles — and the timing of repeated cycles, computer analysis could tease out potential Earth-like worlds in habitable-zone orbits. “Because of Kepler, we know that planets are an incredibly diverse set of objects, much more diverse than we observe in our own solar system,” Hertz said. “One of the common kinds of planets that Kepler detected are planets that are larger than Earth and smaller than Neptune, a type of planet that doesn’t exist in our own solar system. To make such discoveries, Kepler relied on three spinning “reaction wheels,” with a fourth available as a spare, to keep the spacecraft rock-steady during its science observations. Small rocket thrusters were used to counteract the slight pressure exerted on the spacecraft by sunlight. On July 14, 2012, one of the reaction wheels failed, leaving the spacecraft without a backup. Then on May 11, 2013, a second wheel malfunctioned. Engineers tried to find a workaround, but they were not successful. The community then came up with a novel plan to use two wheels and light pressure to achieve the pointing accuracy and steadiness required. Science operations resumed in 2014, kicking off an extended mission known as K2. An artist’s impression of a solar system found by the Kepler space telescope. But all of that took rocket fuel, and last June, engineers saw a major drop in fuel tank pressure, indicating the spacecraft’s tank was nearly empty. Two weeks ago, it finally exhausted the last of its propellant. Engineers managed to downlink all the final science data stored aboard the spacecraft before control was lost. “In the end, we didn’t have a drop of fuel left for anything else,” said Charlie Sobeck, project system engineer. A new, state-of-the-art planet hunter — the Transiting Exoplanet Survey Satellite, or TESS — was launched last April. It is designed to cover an area 400 times larger than Kepler could manage and is expected to find some 20,000 or more exoplanets during the course of its mission.